By Sean Jones: Widely known trainer Teddy Atlas believes the time has come for Gennady Golovkin to retire from boxing following his loss to Saul Canelo Alvarez in their rematch last September. Although Teddy thinks the loss for GGG was a controversial one just the 12 round draw from the first fight, he still thinks he should retire from the sport. Atlas says he sees deterioration in Triple G’s game, and he doesn’t think it’s a good idea for him to fight Canelo Alvarez (51-1-2, 35 KOs) in a trilogy match. Many boxing fans would disagree with Atlas’ belief that GGG should retire from the sport right now. They still see Golovkin (38-1-1, 34 KOs) as the best fighter in the middleweight division, and they feel that his two fights with Canelo were more of a product of a popularity contest where the A-side fighter was given a favorable decision over the B-side guy. If the idea that the guy that deserved the victory should be the one that retires from the sport, then Atlas’s ideas show a bleak upside down world where the losers continue on and the rightful winners are expected to retire. “I think Golovkin should start thinking about [retiring],” Teddy Atlas said on his podcast. “He’s made a lot of money, but there’s a lot of miles on the odometer too. He had over 400 amateur fights, and won a silver medal in the Olympics. He’s 37 or 38. I don’t think he’s going to get better. When it comes to that match-up with him and Canelo, he ain’t getting better. The horse has left the barn. The best of him is gone. Did he get robbed the first time? [against Canelo]. I think so. Did he get a bad decision in the second one? I think so. What, they don’t count jabs no more? But I think he’s eroding; he being Golovkin. He’s been dissipating and sliding in front of us,” Atlas said. For Golovkin to retire after being involved in two controversial decision fights that he should have arguably won against Canelo, it makes zero sense. You have to wonder what Atlas is thinking to come up with some backwards thinking like that? Would Atlas feel the same if one of his own fighters was involved in two controversial fights that he appeared to win, but was a given a draw and a loss respectively. Had this been the Atlas-trained Oleksander Gvozdyk that failed to get the decision in two of fights, would Atlas be banging the drum, saying that it’s time for his fighter to retire from the sport? It’s doubtful. Atlas would very likely be highly upset about the decisions, and he would let the boxing world now about it. As a trainer, it’s hard to picture Atlas telling one of his own fighters to retire after they’ve been arguably jobbed twice against a more popular fighter in Las Vegas, Nevada. “I don’t know if it’s in his best interest to have another fight,” Atlas said about Golovkin in continuing to suggest that he should retire because of his two controversial decision fights against Canelo. “I think he’s made enough money. I think you’ve seen the best of him. I think you see erosion. You see sliding. What’s getting out at the right time? I’m talking truth to a business that takes a lot out of you, and there comes a time to look for the door,” Atlas said. If Atlas thinks that Golovkin should retire, then what are his thoughts on Canelo? Shouldn’t he retire too? He didn’t look so great winning a controversial decision over the 36-year-old Golovkin the last time out. Canelo is supposedly in his prime at 28. 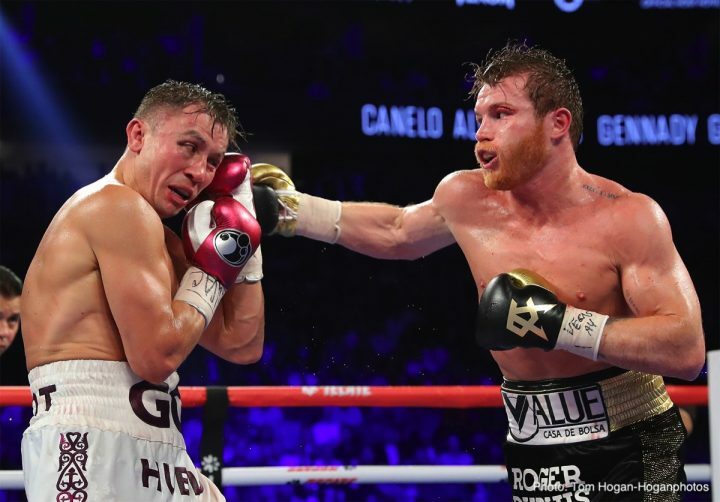 It is it time for Canelo to retire because he was involved in two controversial decisions where the judges failed to give him losses against GGG. Shouldn’t Canelo have been able to beat someone that much older than him like GGG? What does that tell you about Canelo that he can’t beat a fighter that is nearly 10 years older than him like GGG? Should fighters have tor retire after they’ve been involved in controversial decisions where the boxing world thinks they should have won? Atlas doesn’t make any sense at all with what he’s saying about GGG. He openly admits that he thinks Golovkin was involved in two controversial decisions against Canelo, so why does he think he should retire? To hear Atlas talk, it’s no wonder why a lot of boxing fans think he dislikes GGG, because it doesn’t make sense what he says. If anyone should be retiring, it’s Canelo, right? He was the one that is seen as having lost both GGG fights. He’s the one that a lot of fans think was given preferential treatment by the judges in his two fights with Golovkin. Why isn’t Atlas saying that Canelo should retire? Why the guy that appeared to win the fight have to retire? Would that make it easier on Canelo if Golovkin just went away, and let him rule the middleweight division without suffering arguably a third loss to him? Whether Atlas wants to admit it or not, Golovkin is 2-0 against Canelo. He’s perceived as still unbeaten by many boxing fans, and is seen as the people’s champion. When decisions made by three judges in a fight is disagreed with by the boxing public as a whole, then the decisions becomes meaningless, which you can argue is what happened in Canelo’s two fights with GGG. The boxing public have invalidated the two decisions by the Nevada judges for the 2 Canelo-GGG fights, and they view Golovkin as the winner of those two fights. So for Atlas to be saying that Golovkin should be the one to retire after having been on the receiving end of not one but two controversial decisions against the A-side fighter Canelo, it comes across as very strange. It makes you wonder whether Atlas was thinking clearly when he came to the conclusion that Golovkin should be the one that should retire now instead of Canelo. It would have made a lot more sense if Atlas said that Canelo should retire rather than Golovkin. It’s interesting that Atlas feels that GGG should retire when he believes he won both fights with Canelo. If you believe GGG won the fights, then why should he be the one that retire and not Canelo? « Dmitry Bivol looking good preparing for Joe Smith Jr.